The weather here in Worland has been downright beautiful! Perfect for biking as well. That is, except for Friday. On Friday, we had the most insane amount of wind! Earlier in the day, it just felt like good ol’ Okie weather, but by the evening, we could barely shut our car doors because of the wind. As we would run between the car and our appointments, we learned quickly not to open our mouths because they would get filled with dust! Haha, good times. This week we had another lesson with the Williams, who are the part-member family I wrote about last week. They are so wonderful! They’ve been at church every week so far and both parents are progressing a lot. We taught the Restoration this past week, and the Spirit was so strong, even though I totally butchered saying the First Vision, haha. (You’d think that I’d never mess that one up anymore after being out this long… but I guess not! haha). I guess that’s when you know that it’s the Spirit teaching and not you, because if you “mess up” it really doesn’t make any difference. I also met one of our other investigators finally this week- her name is Taylor. 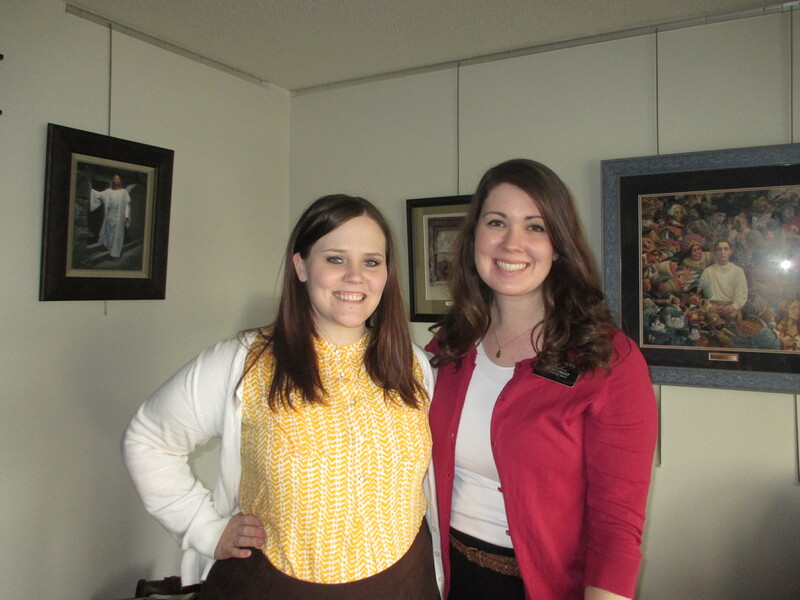 She is a young single adult, so I immediately felt a connection with her since I had worked with YSA’s for the past 7 months. She had a hard week in which her less-active boyfriend broke up with her (which actually sounds like it was a good thing that they broke up), but now she has nothing holding her back from progressing towards baptism for herself! We are going to reteach her some of the basic lessons and help her progress to a baptism date in May! Here’s a slightly humorous story for the week. I met one of our recent converts for the first time, and she is a very elderly lady who was baptized about a year and a half ago. As we were walking up to her house for me to met her and have a lesson with her, Sister Wankier turned to me suddenly and said, “Oh yeah, ummm… she might not have pants on… ok let’s go in!”, and she quickly entered the house. Not really sure what to think, I followed and soon realized exactly what she was talking about. No pants! Nothing! Yeah…. she let us get her a blanket though for her to put over her lap. Gotta love the random experiences of the mission. I love you all so much!! Thank you for your continued support and prayers. Talk to you next week! !